NEW BREMEN, Ohio (June 29, 2010) — Crown Equipment, Apple, Dell, Microsoft, Panasonic and Herman Miller. When it comes to product design excellence, forklift manufacturer Crown Equipment doesn’t take a backseat to anyone. The company – along with some of the world’s most recognized brands – was honored this week by the Industrial Designers Society of America (IDSA) with an International Design Excellence Award (IDEA) for the Crown ESR 5000 Series of narrow-aisle reach trucks used throughout Asia and Europe. This is the fifth consecutive and eighteenth overall IDEA for Crown. No other company has won more IDEAs in the Commercial and Industrial Equipment category in the last 10 years than Crown. The 2010 IDSA IDEA program received 1,855 entries. Only 37 entries earned the gold designation. Submissions came in from Austria, Brazil, Canada, China, Denmark, France, Germany, India, Italy, Japan, Korea, South Korea, Spain, Sweden, Taiwan, United Kingdom and the United States. According to the IDSA, the 2010 IDEA jury was comprised of 18 world-renowned designers and design thinkers. It spent weeks previewing entries online and two-and-a-half days of face-to-face evaluation and debate. Judging criteria in the Commercial and Industrial Equipment category focused on six areas of industrial design excellence: innovation; benefit to the user, benefit to society and natural ecology; benefit to the client, visual appeal; and, appropriate aesthetics. 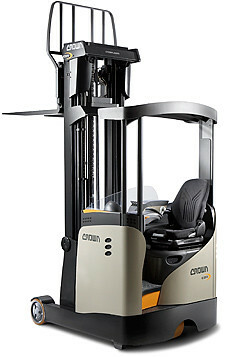 Crown is one of the world’s largest lift truck manufacturers. Crown’s award-winning line of lift trucks maintains a reputation for exceptional product design, engineering, and manufacturing. From the smallest hand pallet truck to the highest lifting turret truck, Crown seeks to provide users with safe, efficient and ergonomic lift trucks that lower total cost of ownership and maximize uptime. Headquartered in New Bremen, Ohio, Crown manufactures lift trucks that are sold throughout the world.